The roof on your home or commercial building is the biggest thing protecting everything that’s inside. At least once a year, to ensure that the roof is structurally sound and all of its parts are sturdy, contact a roofing company for a full inspection. 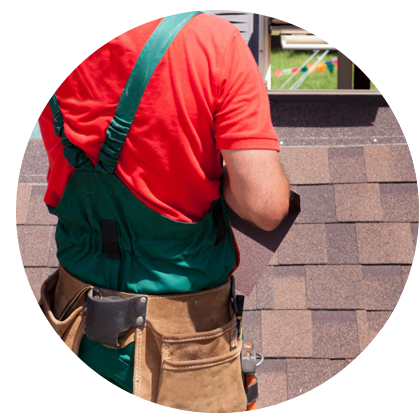 The contractors at Denali Roofing provide thorough roof inspections and will offer effective and cost-efficient solutions to make any necessary repairs. You can count on us to keep your home and business safe. A roof inspection will take between 45 minutes to a few hours depending on the health of your roof, and will potentially prevent significant and costly repairs down the road. In Northern Colorado, early spring is a great time to have your roof inspected to ensure that the heavy weather during the winter months didn’t cause any damage to the roof’s shingles, gutters, and various other components. The contractors at Denali Roofing will inspect of the ceilings, walls, and attic for any signs of wind, water, or hail damage. If there are any stains on the walls or ceilings, this indicates a leak and would need to be repaired as quickly as possible. This includes a close inspection of the shingles, flashings, and gutters. We’ll look for any missing, broken, cracked, or cupped shingles, signs of sun damage, as well as any shingles that may be nearing the end of their life cycle. Extended sun damage will cause shingles to crack, and cupped shingles could be a sign that the roof isn’t properly vented. We’ll look at the building’s flashings and note any cracked, damaged, or missing sections. An important component of the roof system, the gutter inspection includes looking at the sealant, checking for any holes or leaks, signs of sagging, and if there are any signs of a bad installation job. A lot can be learned from an inspection about the health of a roof, making it incredibly important for home and business owners to schedule a yearly appointment. The contractors at Denali Roofing are highly experienced and trained to complete thorough inspections and to offer the best solution, whether that’s a minor repair or a full installation. Denali Roofing is located in Loveland and provides services to Fort Collins, Greeley, Boulder, Longmont, and the greater Northern Colorado area. Give us a call today for a consultation.